A number of years ago I read a blog by psychologist Shefali Tsabary, PhD, and liked it enough to include it on one of my parenting handouts on Reflective Listening. Just recently I stumbled upon Dr. Tsabary’s work again and realized she now has three bestselling books out. Based on that initial blog, I assumed I would like the books, and I do. Here is my summary and review of her New York Times bestselling book The Conscious Parent. She has also written The Awakened Family and Out of Control: Why Disciplining Your Child Doesn’t Work and What Does, which I will review in future blogs. The core question asked and answered by The Conscious Parent is obvious: How can you expect to raise children with a higher state of consciousness and empowerment if you are not a conscious and self-aware parent? Or, as I might say less eloquently: “Deal with your own emotional issues first.” This is why when parents call for “child therapy” I require at least four sessions with parents first. I may never even see the child, because addressing how the parents are functioning emotionally is the foundation for a child’s emotional wellbeing. Working with a child in therapy, then sending her back into a dysfunctional home setting is just an exercise in frustration for everyone. Children, through their behavior, mirror back the unresolved emotional problems of parents. If you are not careful, the wounds of your past will seep into your parenting style, disrupting the relationship you want to have with your child. Dr. Tsabary’s approach focuses on mindfulness or “engaged presence,” which can be difficult to define, but which is impossible when you are caught up in your own emotional struggles. An early chapter is entitled: “Release Your Children From the Need for Your Approval.” I have written extensively about how if we lack self-acceptance we will go out in to the world seeking approval to fill that void and to feel better about ourselves. However, if we depend on our children for approval, this up-ends the normal hierarchy in the family, putting your children in charge of your emotional wellbeing, a job that is unhealthy for them to take on. If you need your children to feel better about yourself, you will engage far more often in judging them, rather than accepting them. This parenting style also trains children to be adults who are fearful of the disapproval of others, turning them into either Self-Blaming people-pleasers or Other-Blaming narcissists. I find this failure is based on the parent’s preoccupation in trying to find a solution their own unmet emotional needs. If a parent does not tolerate shame well, they will be constantly on guard for possible shaming experiences in their relationships. They will be busy self-shaming and blaming or blaming others, leaving little empathy or compassion for dealing with the emotional needs of a child. In contrast, I find that today many children are being taught that some arbitrary “success” in career and academics is the only acceptable standard. We are training up anxious and over-stressed children and young adults who are driven in unhealthy ways to constantly compare themselves to others — and probably find themselves wanting. Celebrating “The Wonder of the Ordinary,” is the author’s prescription for today’s hyper-achieving children. I love this idea, as demanding exceptionalism from children pressures them to never allow failure or imperfection, leading to feelings of low self-worth when they do inevitably fail. If you are looking for a “how-to” parenting book with specific things to do for a tantrum or homework refusal, you will be disappointed with The Conscious Parent. But if you are looking to make a fundamental change in yourself and the relationship you have with your child, breaking the transgenerational cycle of unhealthy parenting, you will not go wrong with this book. 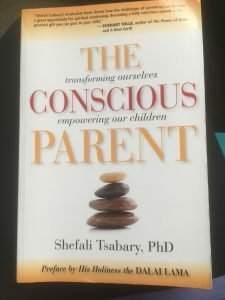 Next up: My review of The Awakened Family by Shefali Tsabary, PhD.